Still looking for that holiday appetizer for your holiday party? This Bourbon Caramel Popcorn is simple and fast to make and is a guaranteed crowd pleaser! This isn’t just another caramel popcorn recipe…the sweetness of the caramel with the salty of the popcorn is a perfect combination! With just a hint of bourbon in the sweet caramel, this Bourbon Caramel Popcorn will have people reaching for more…down to the last kernel! Oh my goodness you guys…I just made an incredible batch of Bourbon Caramel Popcorn! This has to be the simplest popcorn recipe I’ve ever made. Our family is pretty much on holiday break at this point and I was looking for something I could make for us to munch on as we watch all these fantastic Christmas movies in the evenings while we’re enjoying spending time together as a family. Because we are in the movie watching mode, I wanted to snack on some popcorn…but I wanted to “dress it up” for the Christmas season. Let me go ahead and tell you that this is not a sponsored post. Sometimes, when I find a brand or a product that’s ridiculously fantastic, I just like to write about it and share the love with my readers. So that’s what I’m doing here with SkinnyPop Popcorn. I have been eating SkinnyPop Popcorn for years! I travel often for my job (both domestic and international) and every single time before I jump on a plane, I always run to the store to grab my healthy snacks because let’s be honest…I munch a lot. I always, always, always get a bag of SkinnyPop Popcorn. It’s Gluten Free, low in calories and tastes amazing! 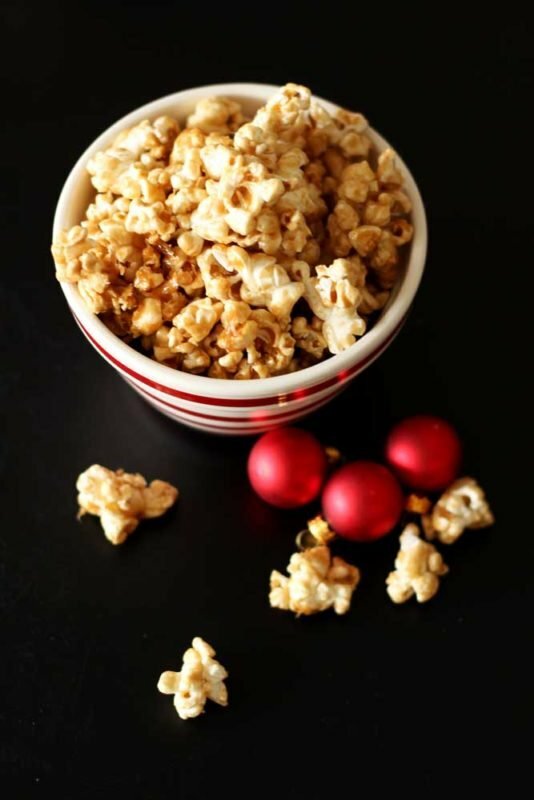 As I was looking around trying to figure out how to best dress up my popcorn for our movie night, I came across a Bourbon Caramel Popcorn recipe from The Brewer & The Baker and their recipe looked amazing! They chose to pop their own popcorn. But I’ll be honest…I’m really busy and not only did I not have time to pop my own popcorn, I just didn’t want to! 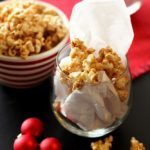 Then I thought about my absolute favorite brand of popcorn and decided to try this recipe using SkinnyPop Popcorn! This recipe was so easy to throw together. The ingredients are simple. The Bourbon Caramel part of the recipe calls for brown sugar, light corn syrup, bourbon, unsalted butter and vanilla extract. That’s it. Since you don’t have to take the time and pop the popcorn with my version of this recipe, all you do is bring the unsalted butter, light corn and brown sugar to a rolling boil over medium-high heat. You’ll stir it for a bit and then remove it from the heat. Then you add in the bourbon and the vanilla extract. Be prepared…when you add the bourbon and vanilla extract to the caramel sauce mixture, it’s going to sizzle and splatter so be prepared to step back a little! You’ll then pour the caramel mixture into your bowl of popcorn and stir to ensure it’s coated well. You’ll bake the popcorn and then let it cool. Then it’s ready to serve. Easy, right?! I’m always looking for new fun and creative ways to serve my appetizers. 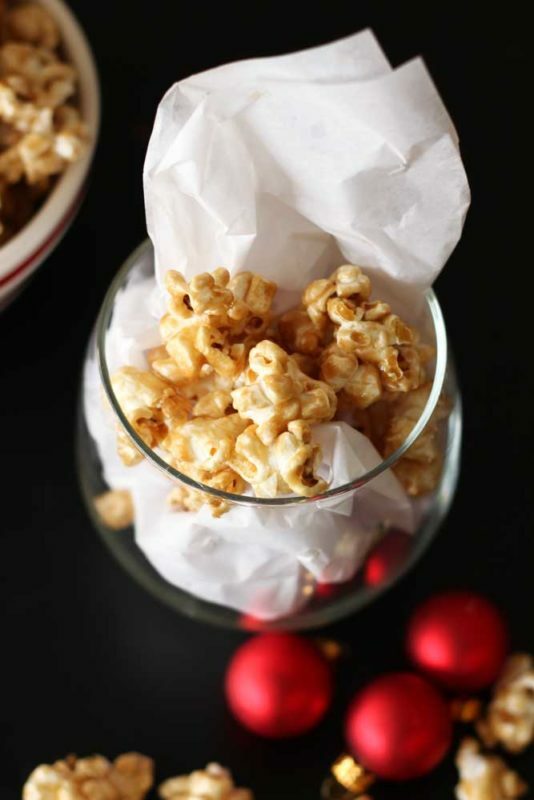 I thought it would be fun to serve this Bourbon Caramel Popcorn in my stemless wine glasses. I put some white tissue paper in the glass and then placed the popcorn on top. You could also use a festive tissue paper for this appetizer during the holiday season! If you’re looking for some additional holiday yummies, check out my Boyfriend Cookies, Cinnamon Apple White Sangria and my Red Velvet Cake! Regardless how you serve this Bourbon Caramel Popcorn, it’s guaranteed to be a crowd pleaser! Enjoy this one and Merry Christmas! Still looking for that last minute holiday appetizer for your holiday party? This Bourbon Caramel Popcorn is simple and fast to make and is a guaranteed crowd pleaser! 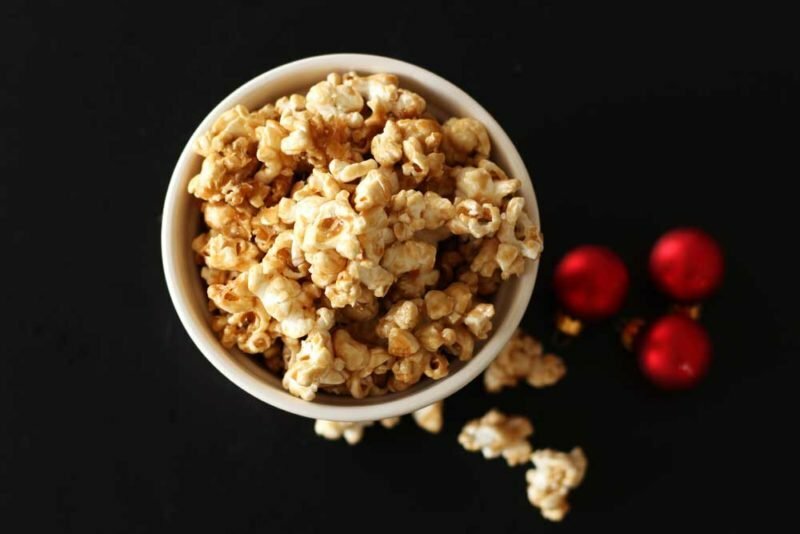 This isn't just another caramel popcorn recipe...the sweetness of the caramel with the salty of the popcorn is a perfect combination! With just a hint of bourbon in the sweet caramel, this Bourbon Caramel Popcorn will have people reaching for more...down to the last kernel! Open the bag of SkinnyPop Popcorn and pour the entire bag into a large mixing bowl. Set aside. Pre-heat your oven to 300. Line a large cookie sheet with parchment paper. In a medium sauce pan, combine the unsalted butter, dark brown sugar and light corn syrup. Over medium heat, melt the ingredients until they come to a rolling boil. You will want to stir the mixture the entire time the ingredients are melting and when it comes to a boil. Once the mixture comes to a boil, let it boil for 5 minutes while constantly stirring. Your mixture will start to thicken a little. Once the 5 minutes is up, remove the saucepan from the heat and slowly stir in the bourbon and the vanilla extract. As you add these ingredients to the caramel mixture, the sauce will start to splatter so be careful. Once the caramel is well mixed, pour it over the big bowl of popcorn and stir with a rubber spatula. The popcorn should now be coated with the caramel mixture. Transfer the popcorn to the baking sheet lined with parchment paper. Ensure the popcorn is spread out to an even layer. Bake for 30 minutes, stirring once halfway through. Once the popcorn is done, let it cool for 15 minutes before serving. Store any leftovers in a Ziplock baggie. 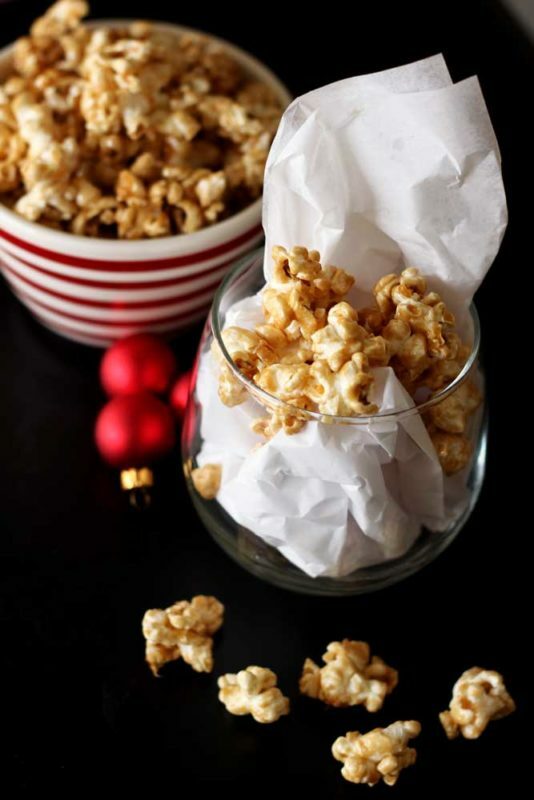 Pin this Bourbon Caramel Popcorn to your Holiday, Appetizer and Snack boards on Pinterest! I am not sure why I stopped making popcorn at home, it has been a really long time since I made flavorful popcorn variations such as yours with bourbon and caramel. As a kid I would have considered popcorn topped with caramel as a novelty, we were so used to plain popcorn with salt in our movie centers! Now I can even add some alcohol! =D Today is movie night so I might make a batch of this! Yeah! Let me know how you love it! Because I know you will love it!! I could eat SO much of this, haha! Sounds delicious. Would also make a wonderful gift for the holidays! Yes! Good idea on the gift! I never thought of that! 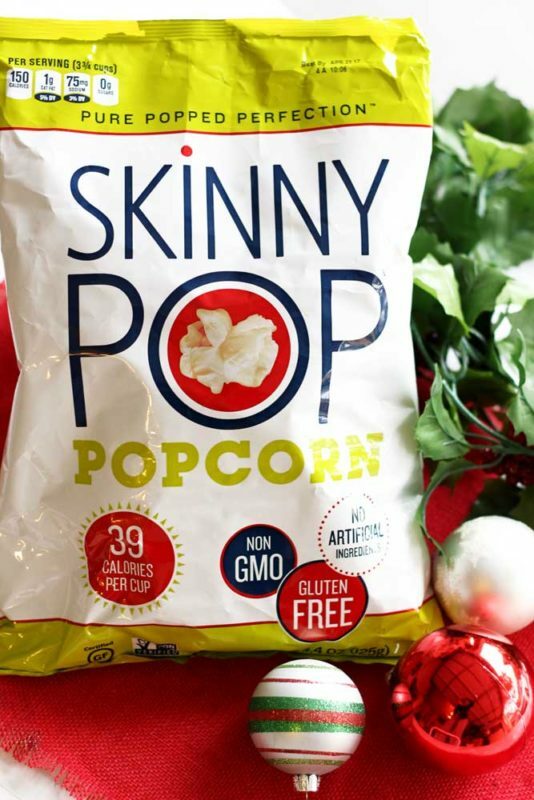 We love SkinnyPop Popcorn! And yours, with bourbon and caramel looks and sounds amazing! 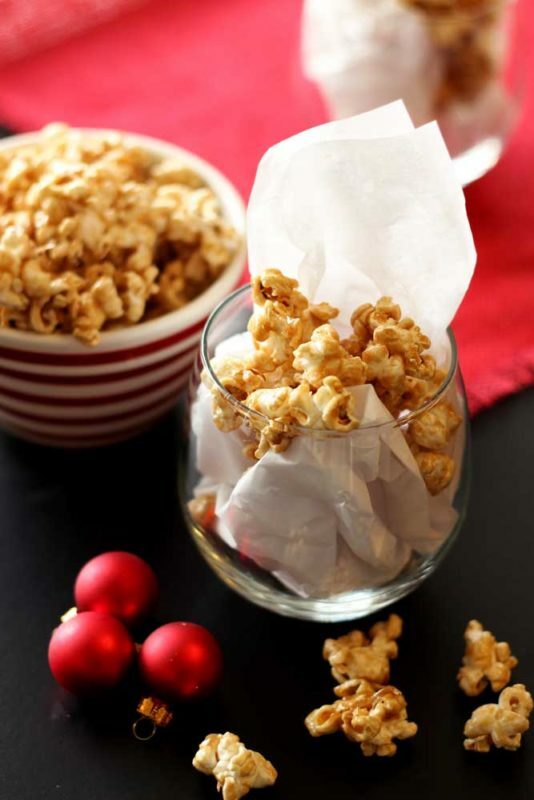 I imagine cuddling on the couch, watching a holiday movie, snacking on this glorious popcorn! Yes! What a great snack for those holiday moments! I believe in putting bourbon in and on everything, so I got really excited when I saw this recipe! HA HA!! Yes – bourbon!! Win Win!